MODEL NS16 - Most Popular! A great example of a period authentic reproduction, antique style, Victorian gas light. The form and style of this model has made it one of our most popular models. 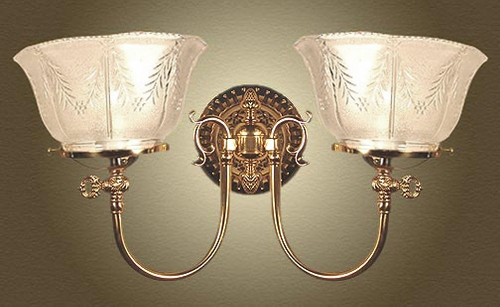 Complete with realistic faux gas keys, this antique style gas light fixture will really show them your impeccable taste! Pictured with a lovely pressed 'Wheat Glass'. Solid brass construction. Width 15 In. / Projection 12 In. / Depth 11 In.